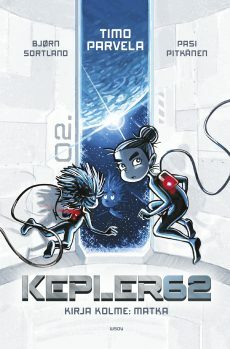 KEPLER62 is now reaching warp speed! Voyage is the third volume in this epic series. “It’s time. Be a credit to the human race.” Old General Livingstone bids farewell to the children who are about to be launched from ravaged Earth into outer space in search of new worlds that could support life. A shuttle takes the young voyagers to a launch pad, where three spacecrafts await them: the Niña, the Pinta and the Santa María. Olivia, a young doctor, is in charge of the expedition. Ari begins to suspect they have not been told everything about the tasks they will have to perform. A long voyage into the unknown stretches out before them.